Fantasy Football Calculator consistently has been one of the better sites to practice your craft of the draft over the last few years. New mock drafts happen every few minutes with a wide range of formats, number of teams, and rounds. It’s easy and intuitive to sign up; just put in a team name, and you can even participate in several mock drafts simultaneously. You can also browse a database of completed drafts and search players ADP (average draft position), to ensure you are getting good value for your picks. Yahoo! hosts one of the biggest and most prominent Fantasy Football sites around, and their mock draft center is equally impressive. 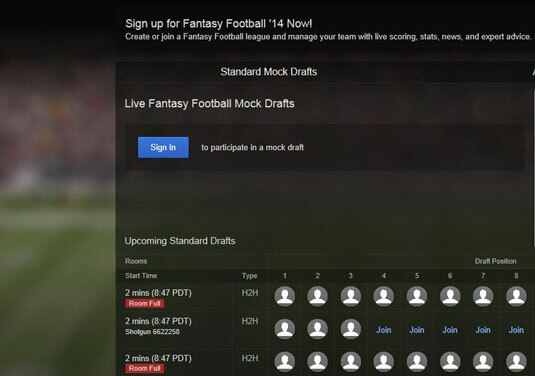 You can choose between standard or auction drafts, select the number of teams, and join. Yahoo! offers nearly all of the formats available, with dozens of mock drafts happening every five minutes. The site has the latest information for NFL team updates, and the research center is concise and easy to understand. Signup requires a username and password. The NFL has a very impressive fantasy mock draft center — everything from the latest fantasy expert advice, draft cheat sheets, and a quality list of player rankings. NFL offers most of the latest formats, and is one of the rare sites to offer IDP (Individual Defensive Player) mock drafts. NFL.com requires email validation and password to sign up. ESPN continues to improve its fantasy information, catering to those playing fantasy football over the last few years. Their mock draft center is well organized, and you can easily find the type of mock draft room you’re looking for. Dozens of drafts happen every five minutes with a wide array of formats, number or teams, and rounds. They have a great wealth of information and analysis at your disposal to make wise decisions. ESPN.com requires email validation and password to sign up. CBS Sports has a clean, easy to use mock draft center. The site offers many of the same formats and options as many of the other online resources, and CBS Sports also keeps a history of past drafts, so you can review and compare how you did against other mock draft participants. Drafts start every five minutes with various options, including a great draft prep area providing all the tools and analysis you’ll need. Signing up for CBSSports.com requires email validation and password. Draft Wizard, by FantasyPros, is an intuitive and detailed mock draft site. Signup is not required, unless you want to save your draft setting or upgrade to the Pro version, which offers many unique features to make your decision-making process that much easier. The site offers one of the more flexible mock drafts sites, with nearly all options customizable; you’ll have many of same tools you find on similar sites for analyzing and ranking players. You can create your own custom cheat sheets and even get help highlighting players that are most likely to represent the best draft value.